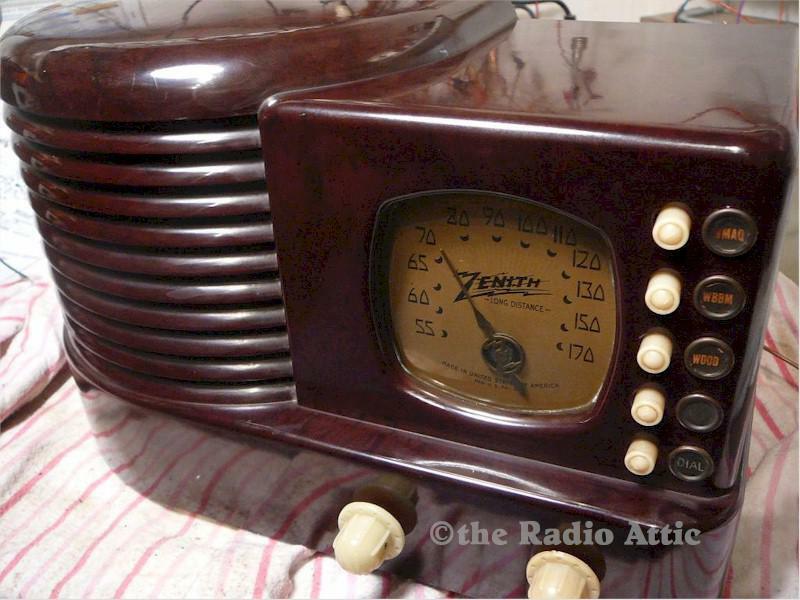 To see more of this seller's radios, visit Pear's Radio Attic. Here is a lovely Bakelite Zenith. What is special about this one is the back is perfect, the cabinet is great, chassis is like new. Look at the pictures of back, front and bottom. It has the gold dial with no defects, a clear window, and is all round very nice. All pushbuttons work, function smoothly and still have the felt buffers on the back. Speaker has no holes, tears, or repairs. There are a couple scratches on the Bakelite that can buff out, no chips or breaks. Works best with an external antenna, but gets local stations with the attached lead. All recapped, aligned, and checked electrically. Schematic and data included. You are visitor number 652 to this page.